There are always ups and downs, and one of my lingering "downs" has been my search for full time and fulfilling employment (I promise this will have a positive message!). It's difficult to question yourself about what you want to do with your life; combined with a sludgy job market where I'm currently living, this creates a real problem. You could say I've been a wanderer; trying out new things, taking opportunities as they come and seeking them out, and "soul-searching" nearly every day. And I've found that it's not a bad thing. I don't want to feel stuck - I want to feel like I have options and that my life is my own. That's how I feel right now, and it's both liberating and frightening. Make a mini quilt 16" x 16"
They are all going to hang together at one of the local libraries early next year. Fun, right? 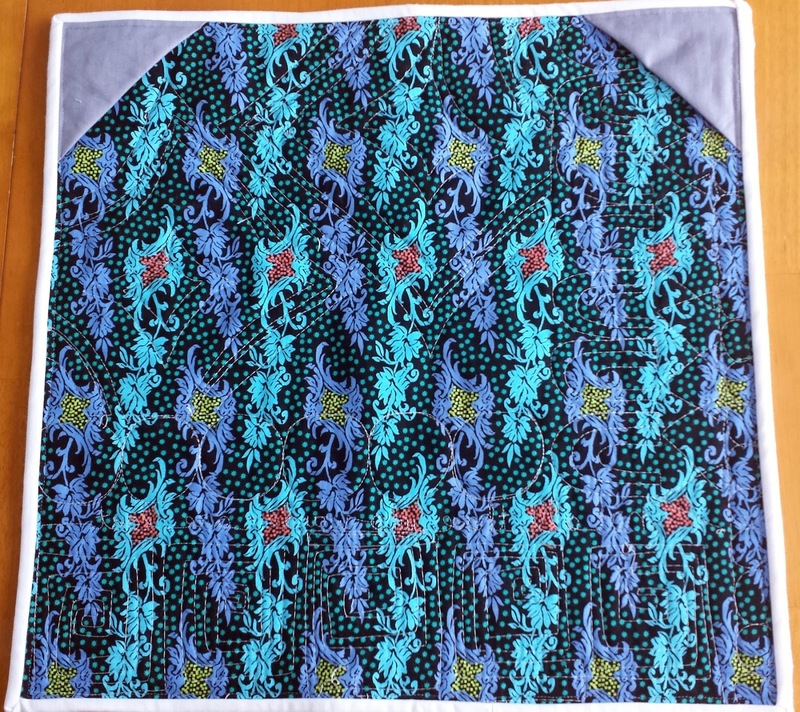 I don't make many quilts with *just* solids (here's the only one I can think of), but that wasn't the problem here. I knew I didn't want to make a traditional block, or a variation of a traditional block. I'm more of a let's-try-this-and-build-on-it-and-see-where-it-goes gal. Improv. Trying something and ripping it out. That's my style. At least that much I know! I created these improv cathedral windows (what I'm calling them, because they are similar, right?) using my gentle improv waves tutorial (a class I'll get to teach early next year! Yay!). No planning (except which wave would go with which color). Just mindless cutting and sewing. Exactly what I needed. Then, since I'm in no way a stickler for symmetry (though I certainly appreciate it when it comes around), I placed them off-center. I decided to build upon them with log cabin-like strips, so that it looks like a woven piece of tapestry. 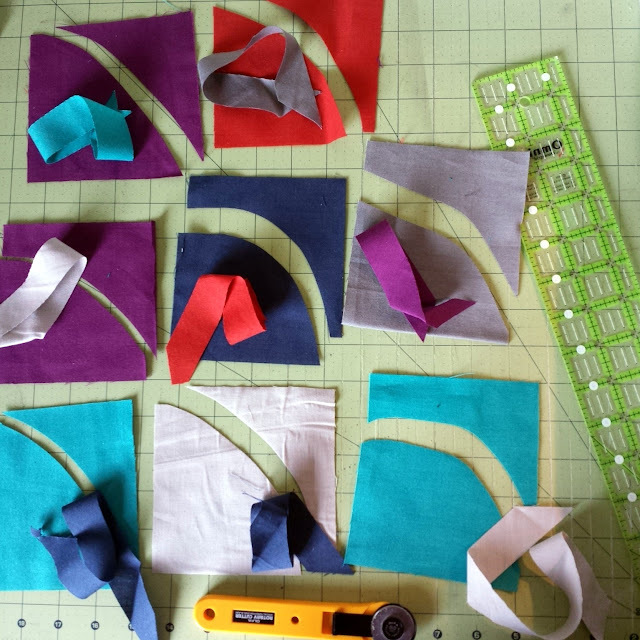 Finally, since quilting is my favorite part, I HAD to quilt each section individually (I mean, the colors are all different too, so it only made sense!). I was stumped with what to add to the red strip, and then one of my favorite quotes popped into my head: "Not all those who wander are lost." J.R.R. Tolkien is one of my favorite authors, and I'm rereading The Hobbit for the umpteenth time with one of my 8th grade students... so it all just came together. 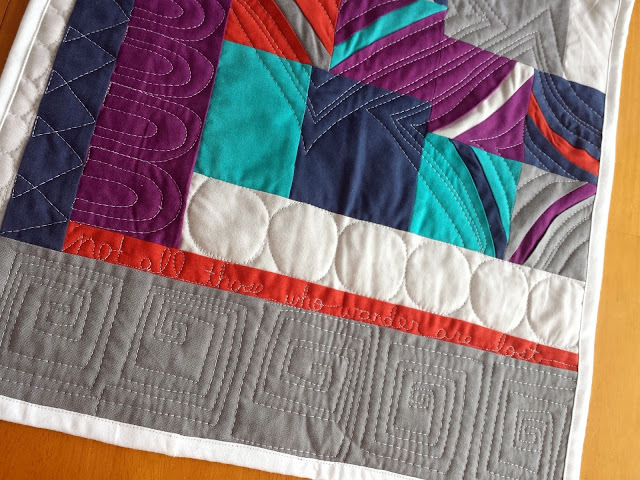 I use Aurifil Dove (#2600), my favorite shade, because I wanted the quilting to illuminate the saturated colors. The quote applies to me. No, I'm not lost, just wandering and looking for my place. Hopefully, this quilt will serve as a reminder to me. Thanks to Cloud 9 Fabrics for sponsoring our guild challenge. Check out #cirrussolidsminiquiltchallenge on Instagram to see what my guild members have been working on! I'm excited to see all the minis at our guild meeting tonight (and of course, I'm looking forward to see all my amazing guild friends, too. Quilters rock!). I love the way this came out! Good luck with finding the right place. I think that embracing the journey and the fact that we are all never truly lost is a huge part of life. I am not always zen enough to fully life that myself, but the quote and will is really going to resonate with so many people, I think. What a cool challenge and awesome fabrics to get to play with. I look forward to seeing your quilt on display! I'm glad you don't feel lost! This post reminded me of the quote about the joy in the journey...or something like that. I realize your journey creates some life stresses though! I hope that the perfect job opportunity comes your way soon! I love all the quilty patterns you put in the quilt, it makes it feel balanced. Keep that positive outlook and it will all work out! Meanwhile, glad you have your quilting to feed your soul. Love this mini--especially your quilting! Enjoyed seeing this mini. I've been challenged to make an improv curve pillow cover. Good luck on your job search. 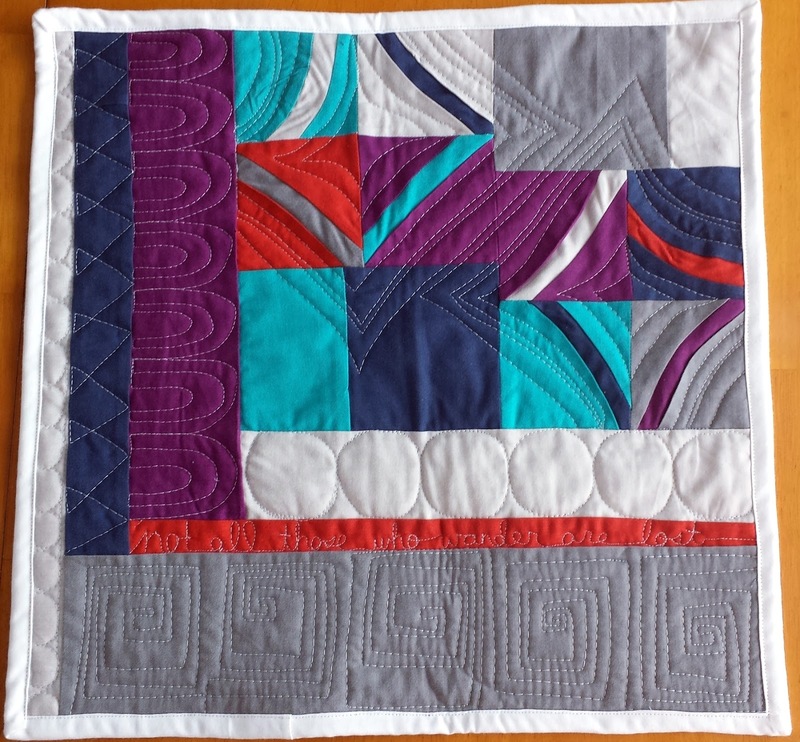 I love everything about this quilt, Jess! The colours, the design, the quilting and especially the deeper meaning. Well done!